How do I become an Adoptive Parent and a Foster Parent? We work with you to complete a standardized assessment (also called a homestudy). You also need to attend 30 hours of training prior to being approved. The standardized assessment also includes obtaining references, completing a police record check and a medical report. When we are completing your assessment, we take into consideration that your past may not define who you are today. 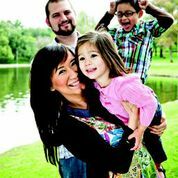 Why become an Adoptive Parent or Foster Parent? People who do this really want to make a difference in the life of a child and their community. They are people who value sharing their lives with a child or children and embrace putting children first. What support and training is available after you are approved as an Adoptive Parent or Foster Parent? Once you are approved, you are assigned a worker who directly supports you in your journey. This worker will support your family when you have a placement and will let you know about any training that might be available. If you are fostering a child, you will receive a daily, non-taxable reimbursement for the living expenses of each child or youth placed in your home. Many other expenses are also covered such as clothing, medical and dental costs, school supplies and recreation fees. If you are adopting, a subsidy may be available to assist in meeting the child or youth’s needs. For more information about Adoption or Fostering and Family and Childrens Services of Guelph and Wellington County, please call 519-824-2410 or 1-800-265-8300. To explore your interest in adopting or fostering, please fill out our online application below.Once we receive your application, we will connect with you about the next steps. Can a message be left? I/We acknowledge that the process of adoption by Ontario residents is governed by the Child and Family Services Act (CFSA), and the Intercounty Adoption Act (IAA). We acknowledge that the process of fostering is governed by the Child & Family Services Act and Foster Care Licensing Regulations. I/We acknowledge that our worker's role is to ensure the best interests of any child who may be placed with me/us when assessing the suitability and eligibility of applicant(s). The worker's recommendation does not guarantee approval by the Children's Aid Society in public adoption, the Ministry of Children and Youth Services in Private and International Adoption of Canada Immigration in International adoption, nor the eventual placement of a child in my/our family. We further acknowledge that the worker's recommendation does not guarantee approval to provide foster care. I/We give full permission to our worker to communicate and exchange information about me/us, in written or verbal form, with other children's aid societies, child protection authority outside of Ontario, private and international adoption agencies, physisians, mental health professionals, referees, other adoption licensees and practitioners, government agencies/departments, and other sources, as necessary, in order to further my/our application. I/We understand that any false statement or omitted information in this application may jeopardize my/our application. Please take a moment to tell us about where you heard about fostering/ adoption or FTP parenting. Newspaper Article; What was the article about and which newspaper?